Work begins on new the new Visitor Centre. 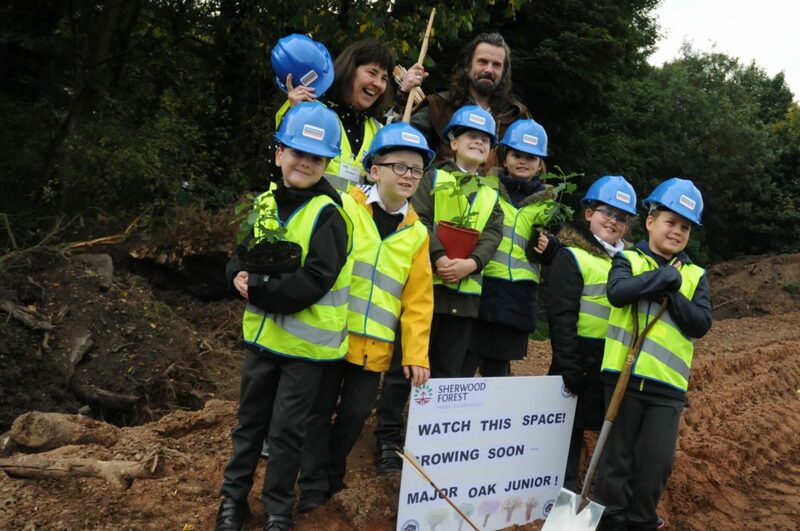 A new chapter in the legendary woodland home of Robin Hood has begun with the foundation-laying of the brand-new visitor centre at Sherwood Forest. The centre has been designed to provide a warm and welcoming gateway to Sherwood’s legendary landscape and help to inspire the 350,000 annual visitors to enjoy and celebrate the forest’s rich and diverse woodland, wildlife and heritage. It is part of an investment of more than £5 million to provide an excellent visitor experience and preserve the forest for generations to come. It’s being built by a consortium led by the RSPB, on behalf of and in partnership with Nottinghamshire County Council, who currently manage the site and have invested more than £4 million in the scheme. A further £200,000 comes from the Garfield Weston Foundation and £40,000 from the Supporting Local Communities fund. The consortium includes The Sherwood Forest Trust, Thoresby Estate and Continuum Attractions, together with The Woodland Trust. The UK’s largest woodland conservation charity came on board earlier this month as an associate partner, to help further support the woodland management plan for Sherwood, and to collaborate on interpretation around the forest’s most famous ancient tree, the Major Oak. The new centre will include information about Robin Hood, the wealth of wildlife, spectacular trees and legendary stories of the forest, which is famous the world over thanks to Robin Hood. It will also include a shop and a café, with a terrace and amphitheatre outside, as well as a brand-new play area. Ross Frazer, the RSPB’s project manager, said: “We’re so excited to start work at the new Sherwood Forest visitor centre. It’s a privilege to be custodians of the Robin Hood legacy, to continue the traditions of this ancient legend and to tell it afresh to new generations. “For the RSPB and our partners, we couldn’t be more proud to be involved in this fantastic landscape, which we hope to protect and conserve for many years to come. When the new building opens in the summer of 2018 at its new position in Forest Corner, the current 1970’s visitor centre and car parks will be removed, and the site where they stand returned to nature. As well as the new centre, the partnership will also manage the stunning ancient woodland within Sherwood Forest National Nature Reserve (NNR). The internationally important NNR contains almost 1,000 ancient oaks, the highest density in Western Europe, many of them more than 500 years old. The most famous, the Major Oak, is thought to be nearly twice that old, and was crowned England’s tree of the year in 2014. According to local folklore, this 23-ton oak offered shelter to Robin Hood and his gang of outlaws. Locally-based contractors Robert Woodhead Limited, are building the new centre, having already completed phase one of the project, which included adding a new car park. The project will be delivered through Scape Venture, a collaborative procurement specialist offering a rapid and efficient approach to delivering innovative outcomes for public and private partnerships and charities. Kartar Consulting are agents on the project, providing quantity surveying services.